Ms. Unique @ BATTLEGROUNDZ Graff Expo Event! MAAC Community Charter School is presenting the BATTLEGROUNDZ event; which will consist of a Graff Expo, BBoy/BGirl Battle and Sticker Swap. So you know we will be San Diego bound on May 2, 2015! This will take place at 1385 Third Avenue, Chula Vista, Ca. 91911. Early Birthday Celebration Road trip for myself and friends. 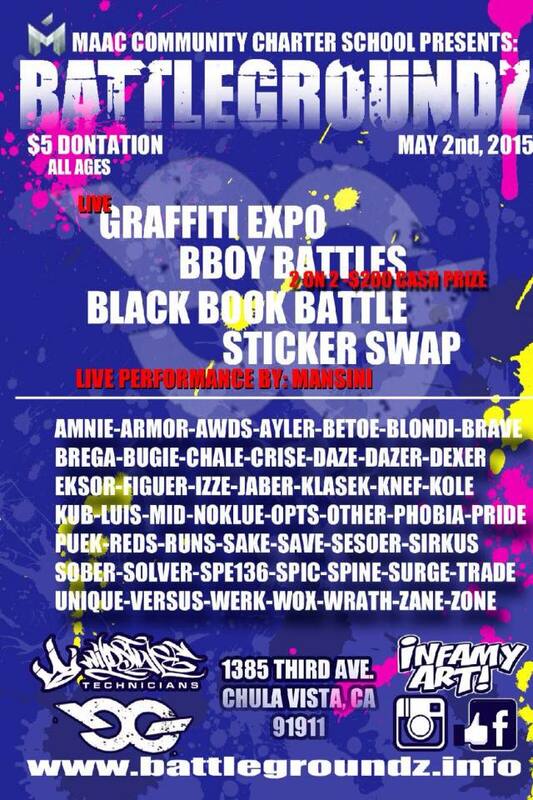 Lets roll and support our San Diego Graffiti Family! I think the last time I was out there was last year when we hosted the Silver and True Blue Battle San Diego in which our brother Zane WCA West Coast Artists took the winning title. The San Diego Graffiti family welcomed me with open arms and haven’t been able to return and show support to their events, so I am really looking forward to this trip down the 5 Sur Freeway. Check out the line up of Graff Artists such as my friend Ms. Unique One; I had actually met her out there in San Diego and ever since our connection we have stayed in touch and support one and other in all we do. Women Rise Together! No excuses Ms. Unique, see you at the BATTLEGOUNDZ!